If you're a Miranda fan you'll no doubt be familiar with the scene when she bemoans her boyfriend for buying her a Savoury Muffin. A savoury muffin?! 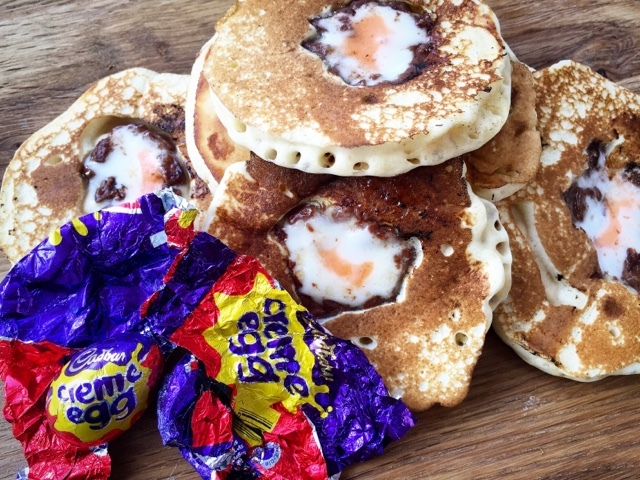 Life is full of enough disappointments Gary… Savoury muffin?! I don’t know you anymore! Goodness only know what she'd make of the recipe I'm sharing today. Wagyu Meatloaf Cupcakes with Sweet Potato Frosting. 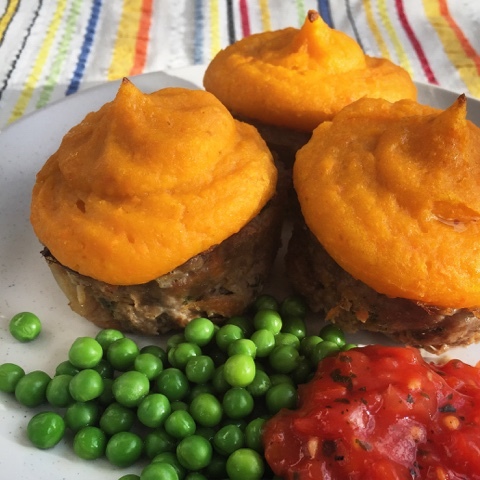 Even more savoury than a savoury muffin these bitesized meaty morsels are made utilising frozen speciality burgers and frozen sweet potato mash. I've got a compact four drawer freezer in my kitchen and a second huge chest freezer in my garage. I really don't know how I would manage without them. Thanks to a recent visit to Iceland both are now well and truly stocked. 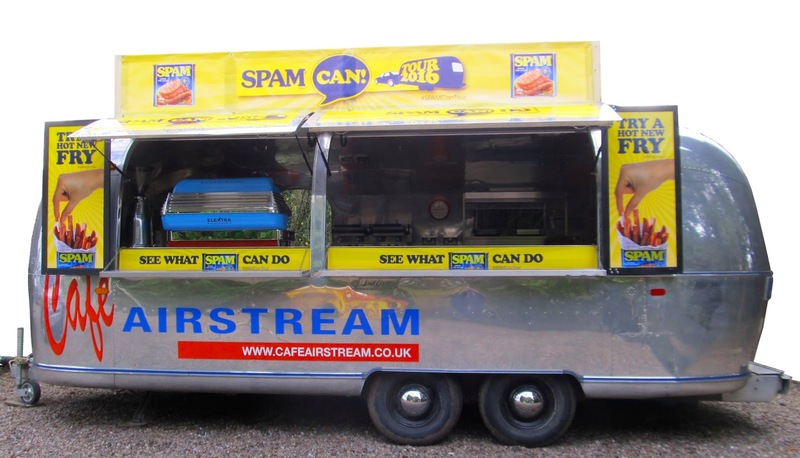 Along with the basics of frozen peas, fish fingers, garlic bread and pizza I also picked up a few surprises. The sheer choice of frozen products in the aisles was astounding. Asparagus Spears, Sweet Potato Fries, Curly Kale and Potato Gratins all made it into my trolley along with Crocodile, Kangaroo, Wild Boar, Wagyu and Venison from the Kenzie range of speciality meats. My kids were particularly delighted with their treat of Millie's ready to bake Cookie Dough. 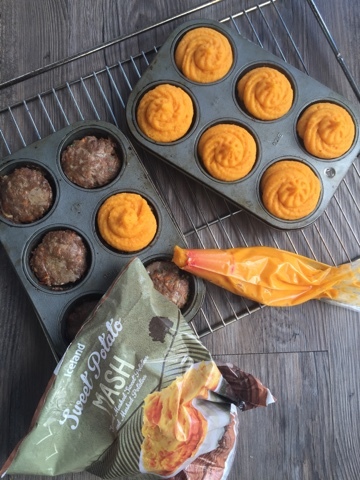 Time to unleash my inner Elsa and unlock the Power of Frozen with my recipe for Wagyu Meatloaf Cupcakes with Sweet Potato Frosting. These cute cupcakes are irresistible to kids both big and small. 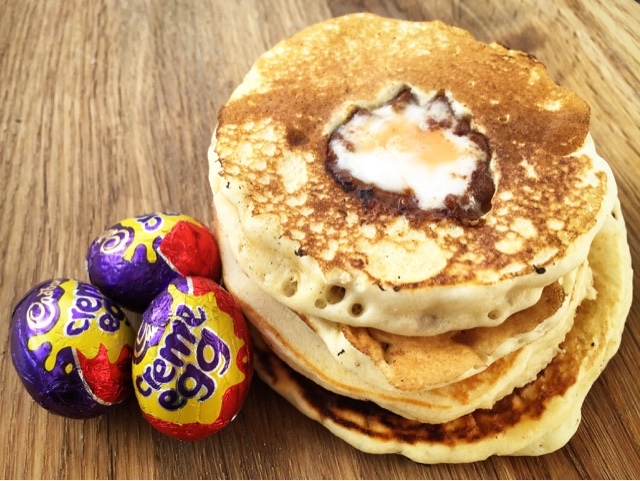 Super quick and easy to make you could even decorate them with sweetcorn and pea 'sprinkles'. 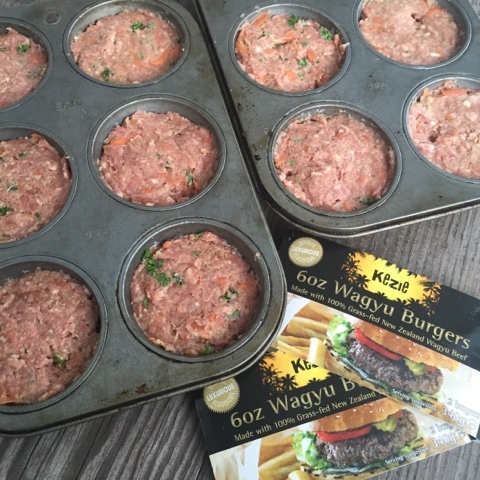 Place the defrosted Wagyu Burgers into a large bowl and add the onion, carrot, beaten egg, breadcrumbs, mustard, Worcestershire sauce, garlic, seasoning and parsley. 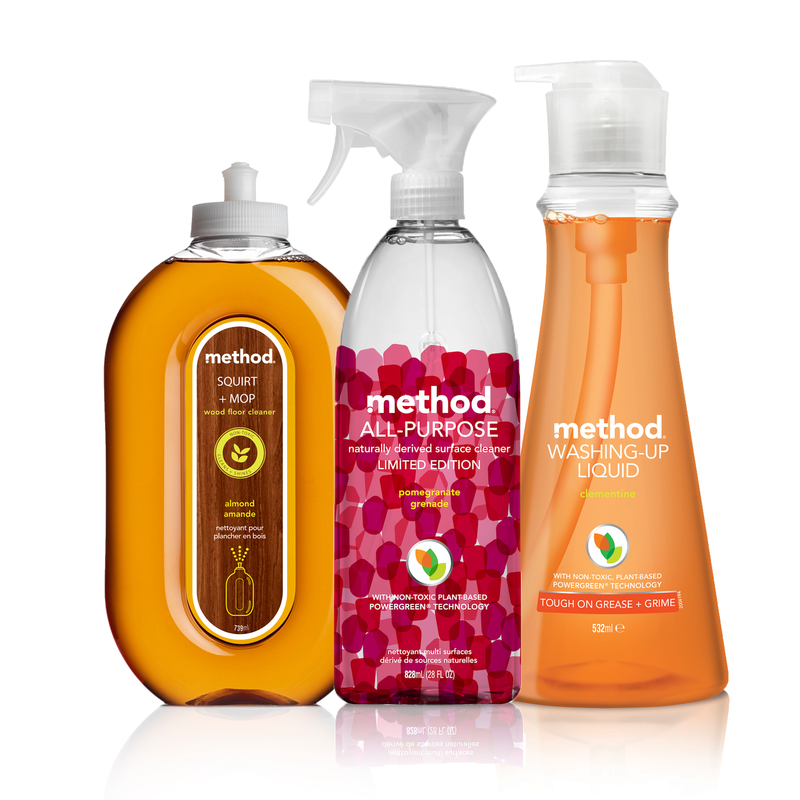 Mix well until fully combined, easiest done with your hands. 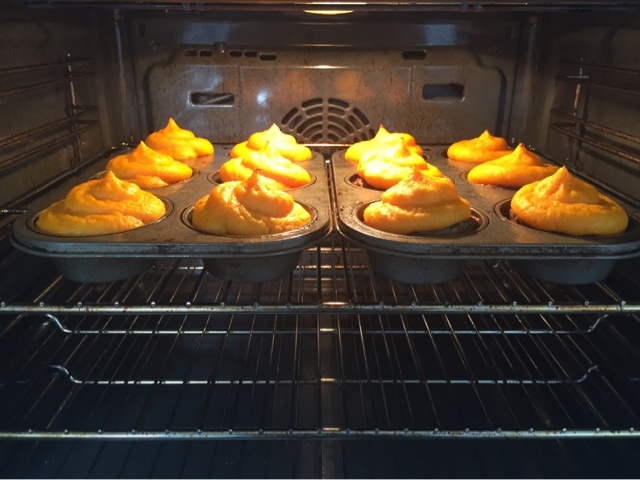 Grease a 12 hole muffin tin and divide the meatloaf mixture equally, compacting it down to fill each hole. Place in the oven for 15 minutes. Meanwhile cook the sweet potato mash according to the packet instructions and allow it to cool slightly. 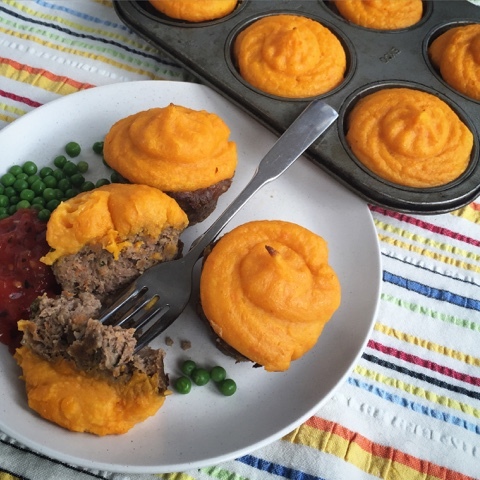 Remove the meatloaf cupcakes from the oven and drain off any fat. 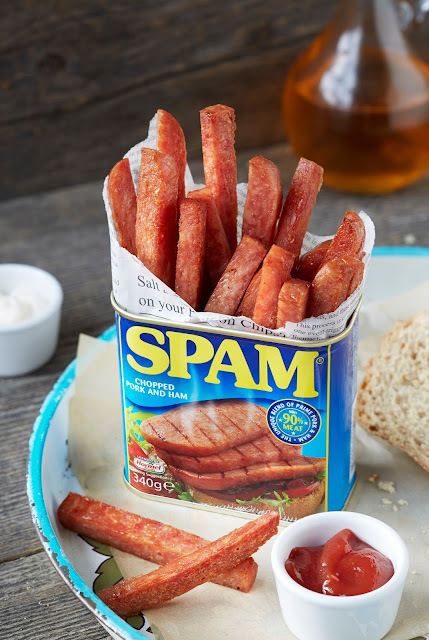 For further #PowerOfFrozen inspiration take a look at these recipes from food blogging colleagues who have also been finding out what surprises lie within the freezers of Iceland. The Dubliner Irish Whiskey and The Dubliner Irish Whiskey & Honeycomb were launched at the end of last year to great acclaim. 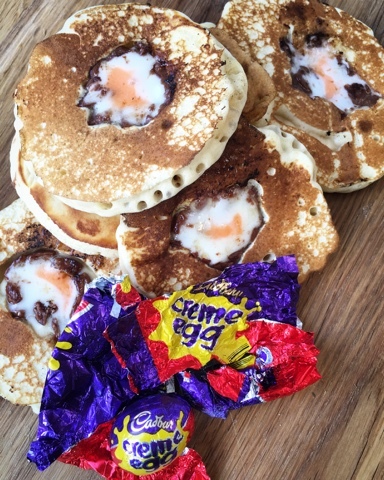 Perfect at any time of the year they'd be sure to be a hit for St Patrick's Day on March 17th which will be celebrated by the Irish and the Irish at heart across the world. What began as a religious feast day for Ireland's patron saint has now evolved into an international festival celebrating Irish culture with parades, dancing, food, drink and a whole lot of green. 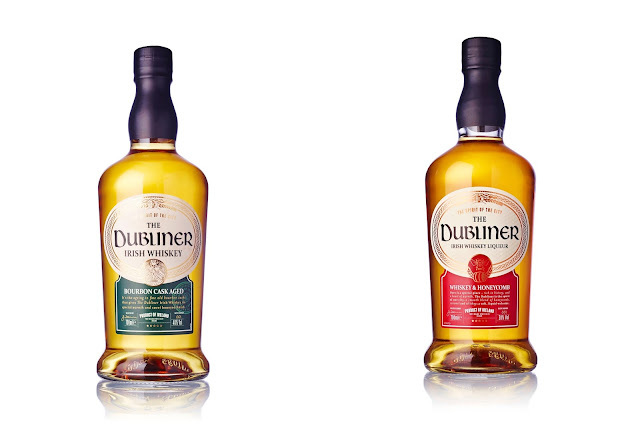 Both The Dubliner Irish Whiskey and The Dubliner Irish Whiskey & Honeycomb Liqueur can be drunk on the rocks or as part of a delicious cocktail. I'm not a huge fan of Whiskey but am totally sold on the concept of liquid crunchie! 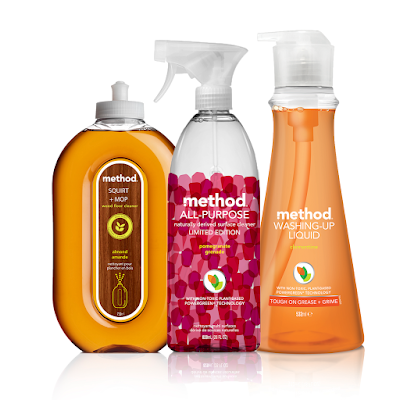 Read on for a couple of cocktail recipes and your chance to win a bottle of each. 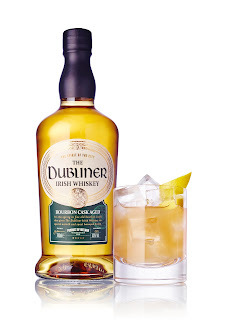 The Dubliner Irish Whiskey is a blend of single malt and grain whiskies, aged in the finest Bourbon oak casks which are individually selected for blending, giving a warm and smooth whiskey with a lasting finish. Available from 31Dover.com and Wine Rack. Price from £22.50. 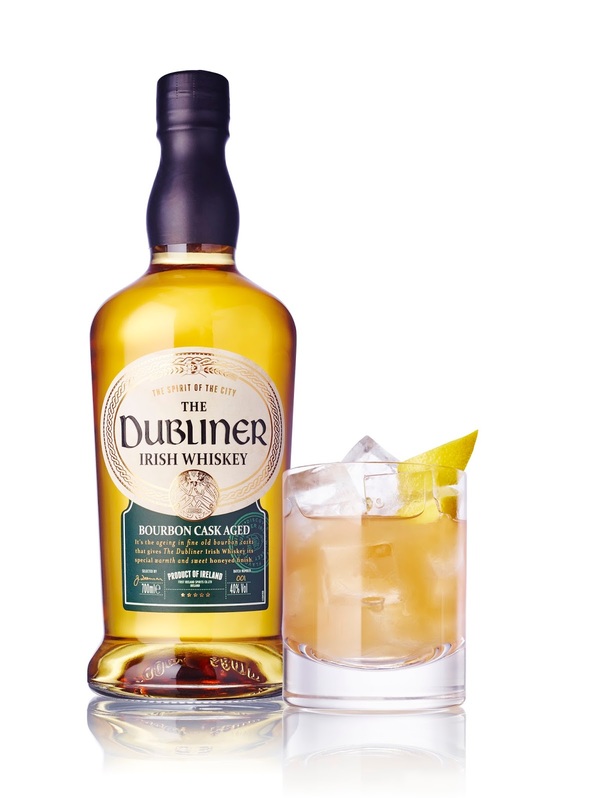 The Dubliner Irish Whiskey & Honeycomb Liqueur is a smooth blend of honeycomb, caramel and triple distilled Irish Whiskey crafted in Ireland and tastes like “Liquid Crunchie”. Build in the glass and gently stir. Garnish with lemon peel and add ice cubes. 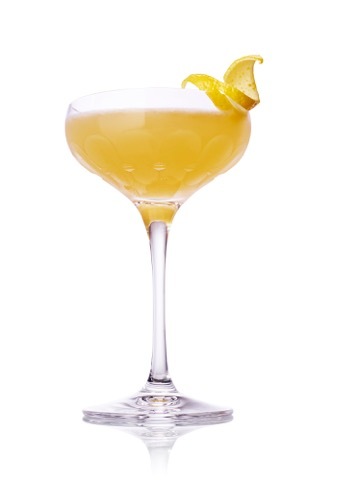 Shake over ice and strain into a martini glass. 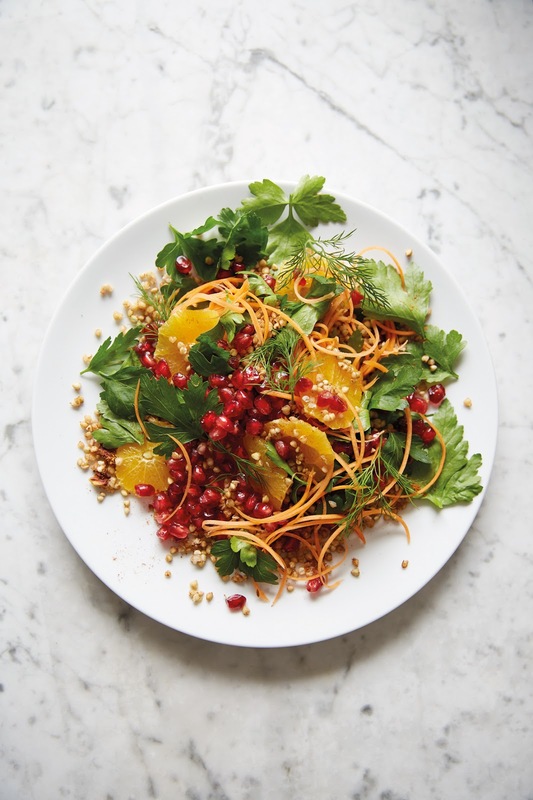 Garnish with lemon zest. 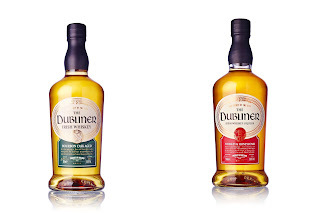 Quintessential Brands Company Ltd have provided 1 x bottle of The Dubliner Irish Whiskey and 1 x bottle of The Dubliner Irish Whiskey & Honeycomb Liqueur (combined rrp £45) as a giveaway for readers of Foodie Quine. No purchase necessary. Open to UK residents 18+ only. One winner will be drawn after the closing date. Normal restrictions apply. Promoter: Quintessential Brands Company Ltd., Melbury Park, Clayton Road, Warrington, Cheshire W13 6PH. Entry is via the Rafflecopter widget below. To enter, let me know in a comment "How do you celebrate St Patrick's Day?" For additional bonus entries you can follow me on Twitter, tweet about the Giveaway, follow me on Instagram or like me on Facebook. 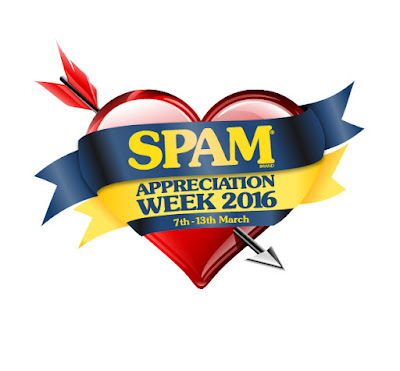 Giveaway ends 17th March 2016 12:00am. The Luck o' the Irish to you! In the Chinese calendar 2016 has just been heralded in as The Year of the Monkey. 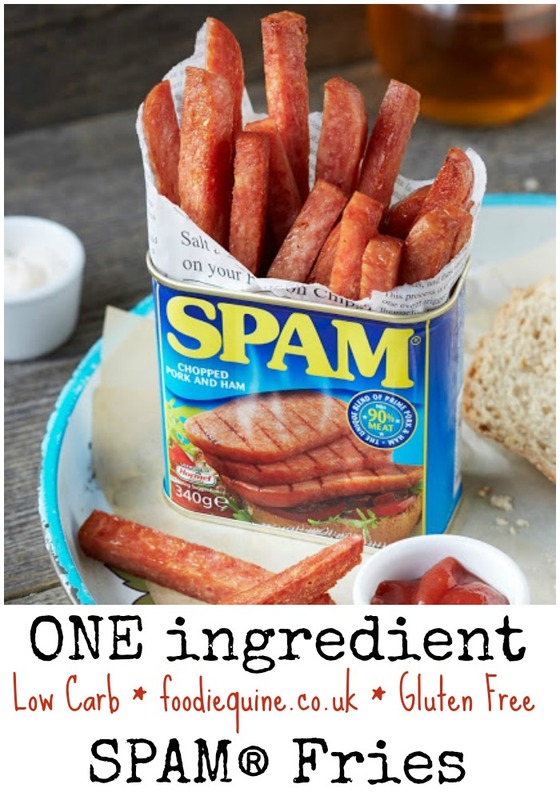 No better time for me to share an Asian inspired recipe. Chinese New Year lasts for 15 days and it's timing is dictated by the lunar calendar, thus it falls on a different date each year. Also known as The Spring Festival it is the most important holiday on the Chinese Calendar. The celebration is older than even the Great Wall itself! Upon checking the Chinese Zodiac it turns out that myself and my husband are both Rats, my Daughter is Monkey and son a Horse. Apparently despite it being my daughter's year it's a sign of bad luck not good and she needs to deck herself out in the auspicious colour of red to avoid offending Tai Sui, the God of Age in her Zodiac year. There has been a wonderful three part series on the BBC this past week "Chinese New Year : The Biggest Celebration on Earth" If you missed it I'd urge you to catch up on iPlayer while you can. It provides a wonderful insight into this massive annual celebration and the three episodes cover migration, reunion and celebration. I was enthralled by the stunning Harbin Ice and Snow Festival and amazing fireworks and dashuhua displays and fascinated by traditions such as ice swimming and family portraits. The Hairy Bikers Si and Dave covered the food side of the celebrations in their own inimitable style and had my mouth watering. Would you believe that a sixth of the wolds population travel home to be with their families for Chinese New Year? It really is the world's biggest party. 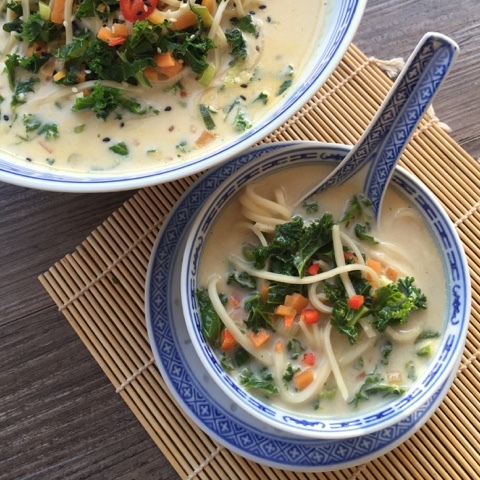 My Asian Kale, Noodle and Coconut Broth is super quick and easy to make and shows that there's a lot more to Chinese cookery than the same boring old stir fry or the monosodium glutamate heavy dishes of the local takeaway. Once all the prep is done you can have it on the table in less than 10 minutes. 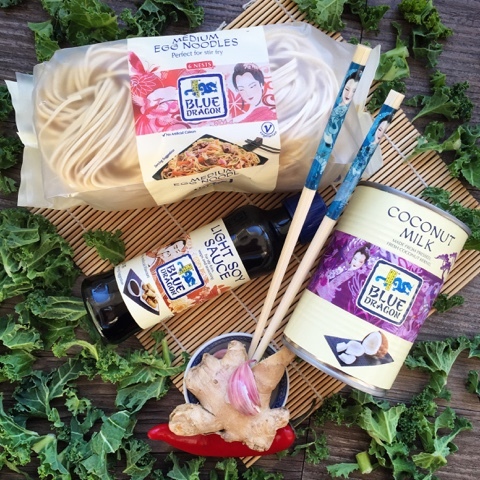 There are no complicated specialty ingredients required so you can feel confident in tackling the recipe with products from Blue Dragon. The base of the broth is the holy trinity of Chinese cooking - spring onion, garlic and ginger and it's spiced up with red chili and ground coriander and then cooled down with coconut milk and seasoned with soy sauce. There's a real freshness about it's flavour and whilst I've kept it vegetarian, meat eaters could add chicken, salmon or prawns. Cook for 3-4 minutes until softened. Add the kale, noodles and stock. Bring to the boil and simmer for 5 minutes. Pour in the coconut milk and gently warm through. Season with Soy Sauce. Serve topped with the reserved spring onion, red chili and sprinkle with white and black sesame seeds. 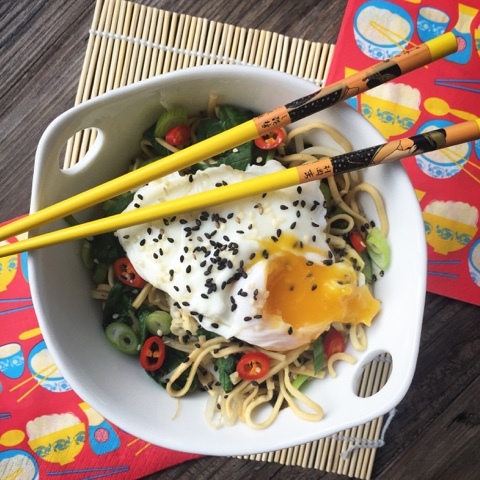 For further #MagicineveryMeal inspiration from dishes featuring Blue Dragon products take a look at the recipes below from some of my blogging colleagues. Gong Hey Fat Choy! If you fancy using Kale in a sweet dish do check out Kate at Veggie Desserts who has created and awesome Kale Cake with Apple Icing. Ahhh... Sunday Morning. Long lie, big breakfast and the Sunday Papers. It's 54 years since The Sunday Times launched Britain's first full colour Sunday newspaper magazine. 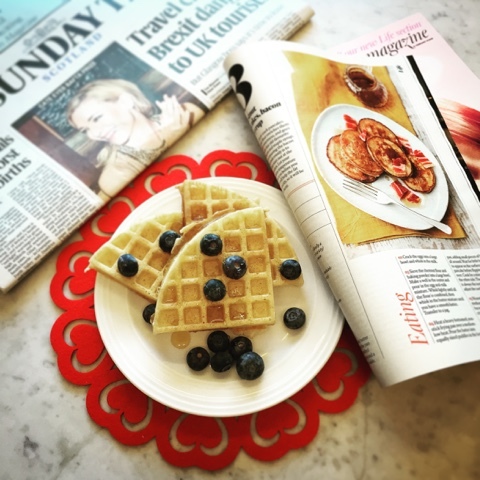 A lot has changed in the world since then and how we receive our news and media has been revolutionised but there's still nothing quite like sitting down with a cup of coffee and the Sunday paper. Much of the joy of the Sunday Times is it's sheer size and depth of coverage. There really is something for everyone. Today the Magazine has relaunched with a new line up of writers and the addition of Driving and Life sections. 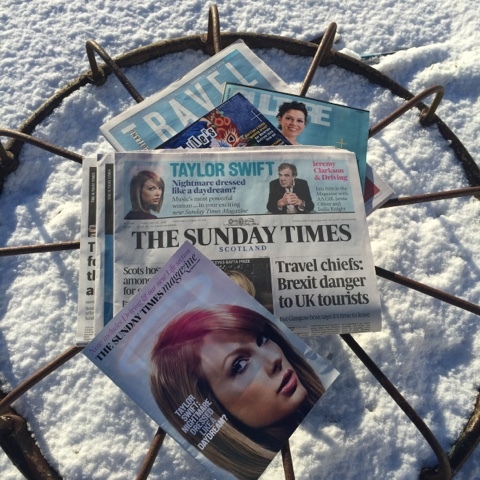 Of course today is also Valentine's day and nothing quite says true love like your husband getting up early and fighting through the snow to bring you said Sunday Papers. 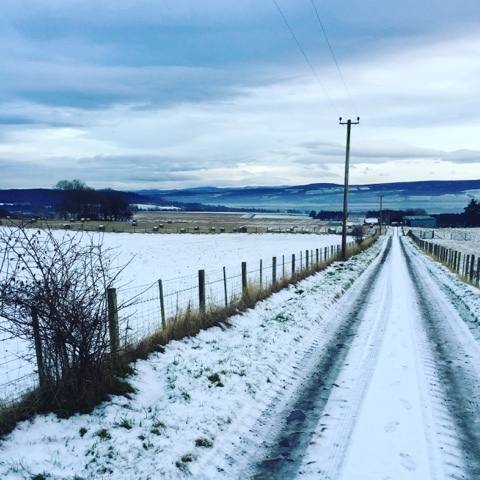 It's half term here at the moment and we're up visiting my parents in The Black Isle. This morning it looks more like The White Isle. Needless to say my kids were very excited. Do you wanna build a snowman? But before they could they had to have breakfast. Belgian Waffles were the order of the day whilst I drooled over a recipe for Chestnut Pancakes with Bacon and Syrup. First outing for a new Waffle Maker from Sage by Heston Blumenthal. No surprise that I always head for the food and drink section first in any magazine. Eating with the Sunday Times includes contributions by Jamie Oliver, AAGill, Florence Knight and Damian Barr. Jamie's recipe for Southend Chowder sounds amazing, a real winter warmer for a snowy day. I'm now hoping that my next Fishbox contains cockles. If you subscribe to the online edition of the Sunday Times (currently £20 for 13 issues) you can share and save recipes from your tablet. 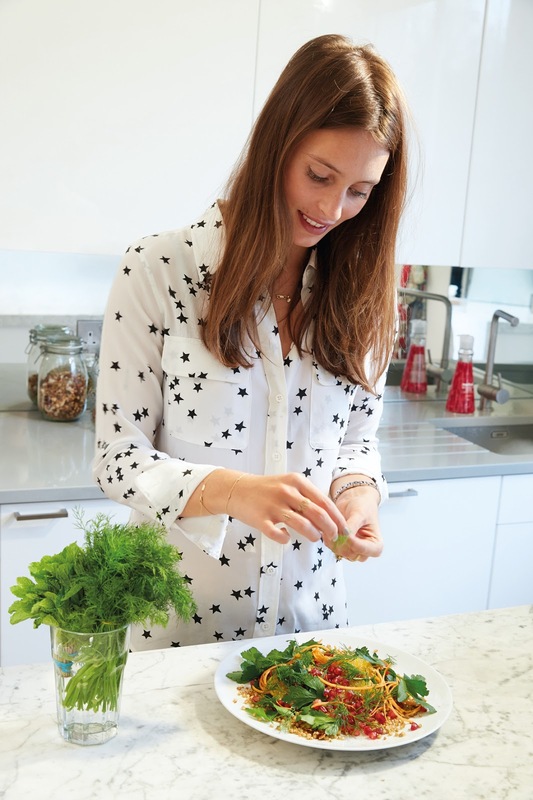 The three brunch recipes from Florence Knight would be perfect for a lazy Sunday morning. Blood Orange & Rosemary Juice, Poached Eggs with Braised Leeks & Creme Fraiche and not forgetting the Chestnut Pancakes which initially caught my eye. The inimmitable AA Gill is still there with his pithy Table Talk reviews whilst Damian Barr tells us what we shoud be drinking this week to accompany our box set viewing. A phenomenan that has completely passed me by. I'll take the Paso-Primero Tinto Somontano 2014 but skip the Nashville. 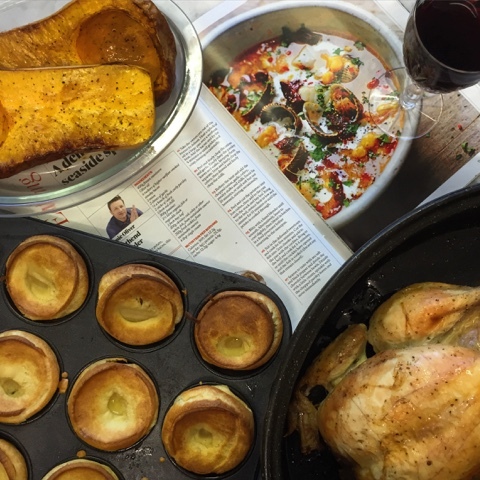 No Southend Chowder for our Sunday lunch but instead roast chicken, baked butternut squash and Yorkshire Puddings. Outwith the food content the big names to move to the redesigned Sunday Times Magazine are Jeremy Clarkson and India Knight. Both previously had columns within the paper and are joined by Simon Barnes with a new Nature column. Life your guide to modern living comprises of eight sections - love, how it feels to..., relative values, body, eating, tech, driving and a life in the day. With a mug of tea in hand I drooled over the wonderfuly quirky and colourful Ice Fishing Sheds. The Canadian equivalent of British beach huts. Joined India Knight as she celebrated gentle pleasures and the decency and joviality of Terry Wogan. It was a delight to dip into the world of Burlesque with Dita Von Teese, experience pop stardom with Taylor Swift and discover how it feels to survive a bear attack. As for the final page interview with Nigel Farage, I've saved that to light the fire with. Disclosure : This is a paid review commissioned by The Sunday Times Magazine. All views expressed are my own. 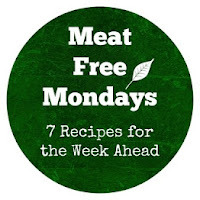 I'm featuring an old favourite today. 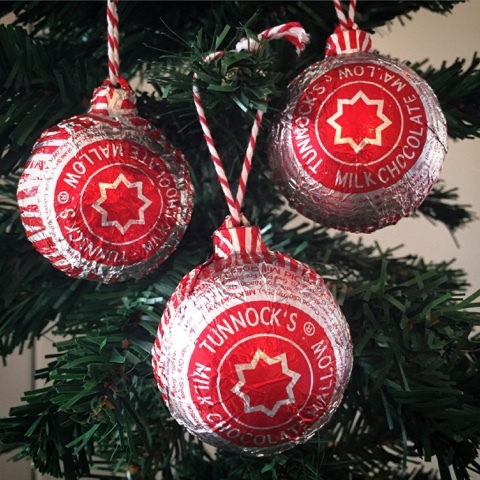 The Tunnock's Teacake. 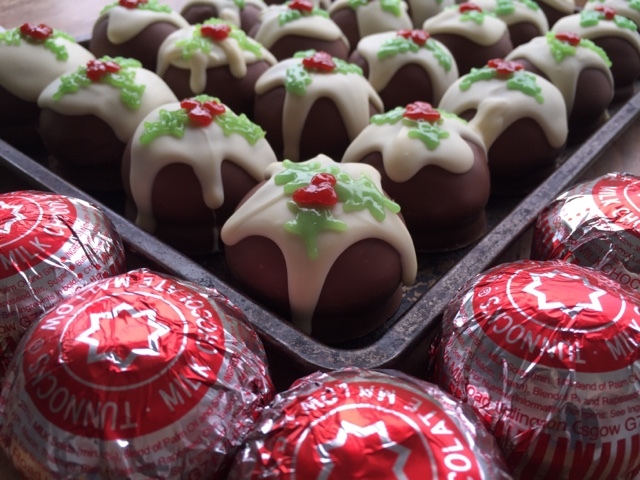 There's a whole lot of love for them and if only I could come up with a recipe which incorporates Irn Bru, Gin and Tunnock's Teacakes I'd be onto a surefire winner as all three are immensely popular with my social media followers. 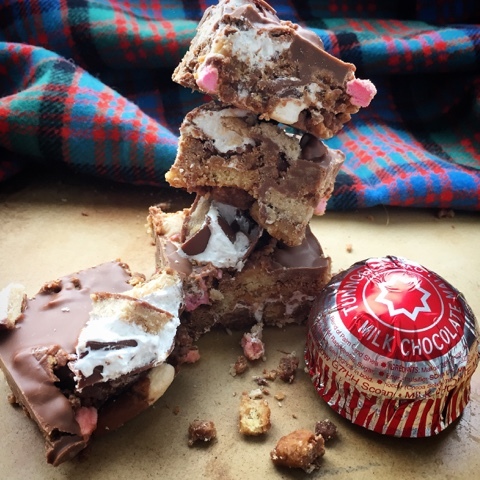 But today I'm celebrating purely the biscuity and marshmallowy goodness of the most iconic of Scottish confectionery. 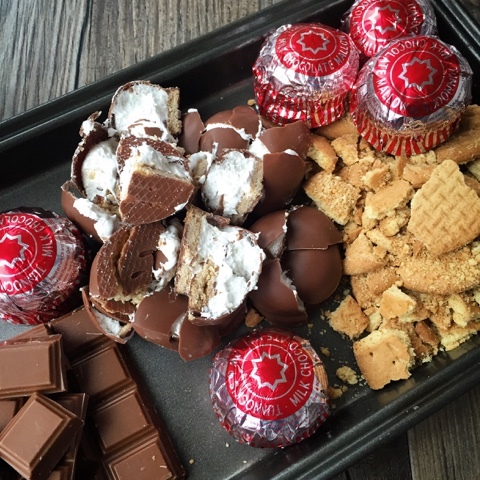 Inspiration came to me upon realisation that the Teacake's component parts of Chocolate, Marshmallow and Biscuit are also those of Rocky Road. Why not combine both? 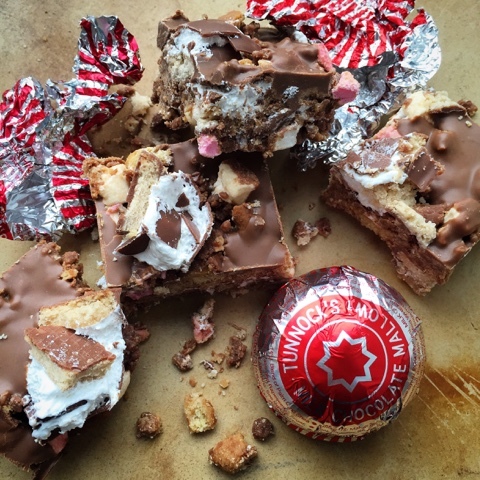 And so Tunnock's Teacake Rocky Road was born. Scotland in a traybake. 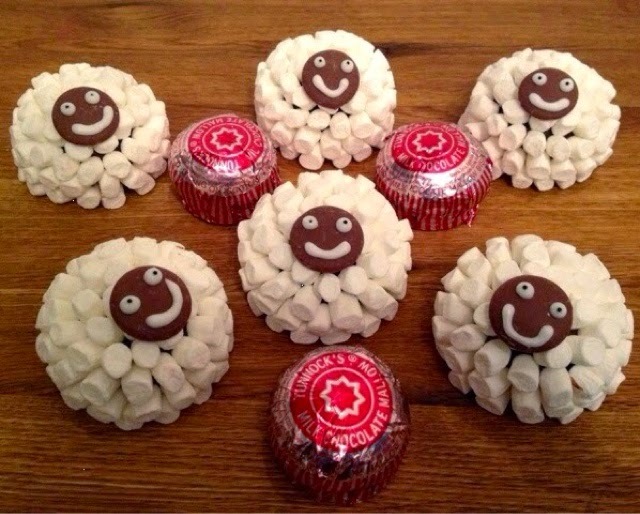 Cut the Tunnock's Teacakes in quarters and set half aside. 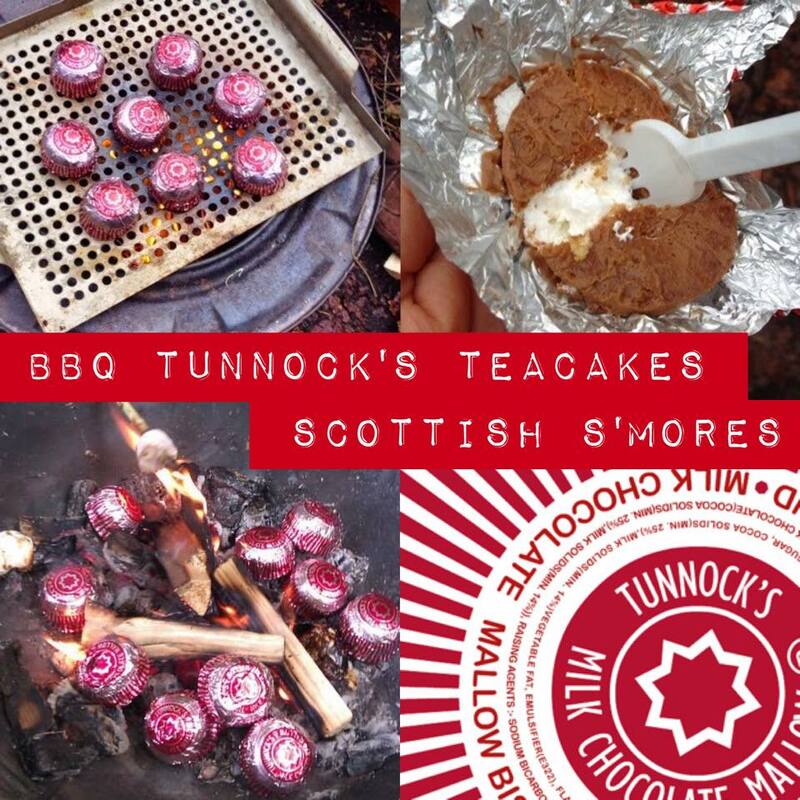 Fold the bashed biscuits into the melted chocolate mixture in the saucepan, then add the mini marshmallows and finally half of the chopped up Teacakes. 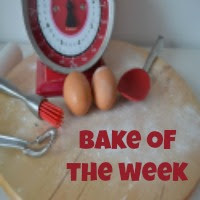 Tip into a greased/lined traybake tin (aprox 34cm x 20 cm) and flatten as best you can with a spatula. Nestle the remaining quarters of Teacakes into the mixture. Melt the 150g of chocolate in a microwave or over a bain marie and pour it over the top of the Rocky Road avoiding the Teacake quarters. Refrigerate for at least a couple of hours or overnight. 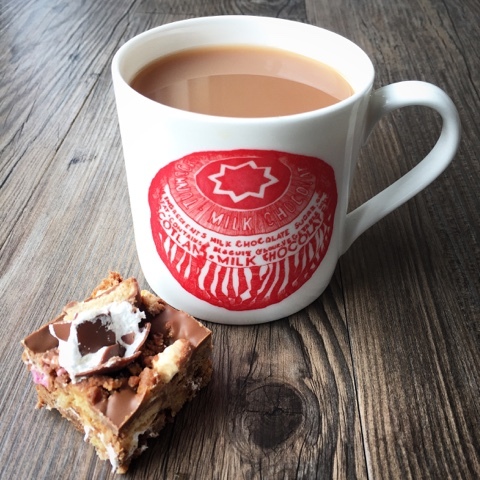 Cut into squares and enjoy with a cuppa. I'll need to get my thinking cap on for my next creation. Any suggestions? The dish I'm sharing today is more of an idea than a recipe. 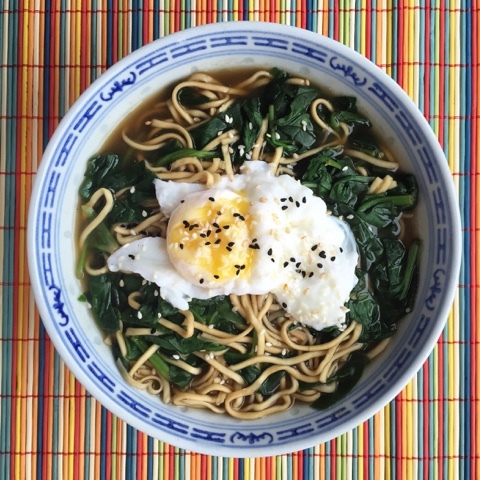 A starting point to go on and create your own Miso Soup Noodle Bowl. 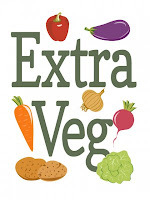 It's something that I regularly have for lunch and from a couple of store cupboard basics, some veggies and an egg can be thrown together very quickly. You can even go meaty and add some cooked prawns or chicken. 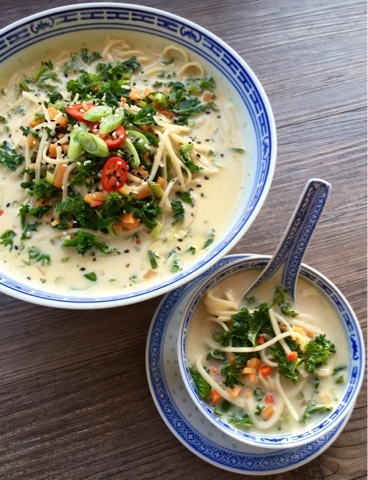 It's Chinese New Year on the 8th of February so I guess this recipe could be a nod to the year of the Monkey. It's one of those dishes that's good for using up fridge leftovers and comes in at minimum cost and maximum taste. Veggie wise you could use leafy greens like cabbage and kale, thinly sliced mushrooms and grated or spralised carrots and courgettes. Pretty much anything that is quick to cook. A handful from a bag of stir fry veg would be perfect. Squeeze the miso soup paste into a saucepan along with 400ml of boiling water and the dried egg noodles. Set the timer to cook for 4 minutes - or as per the noodle pack instructions. Slice up the chilli and spring onion keeping some aside for garnish. Once the noodles have had a couple of minutes add the beansprouts and in a separate pan poach an egg. For the final minute of cooking add in the spinach, spring onion and chilli to the noodles. 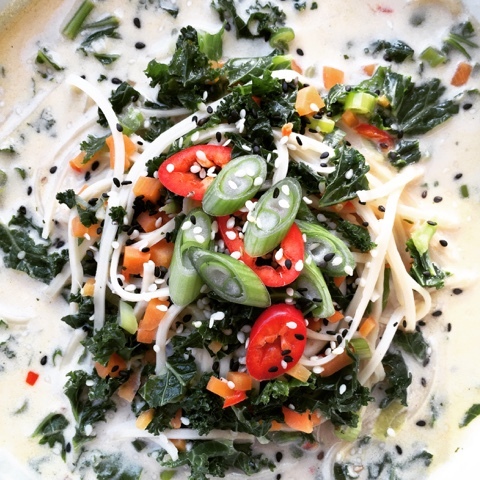 Pour the noodles, veggies and miso into a serving bowl. 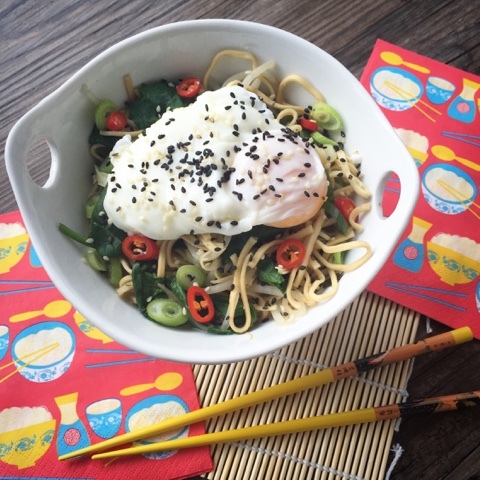 Top with the poached egg and sprinkle with white and black sesame seeds and the reserved spring onion and chilli. 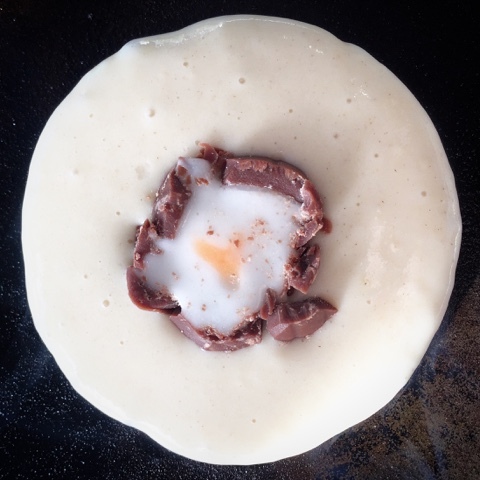 Fill a mug with boiling water and place your egg, still in its shell, into it for a couple of minutes. Fill a small saucepan with salted water, bring to the boil then turn down to a simmer. 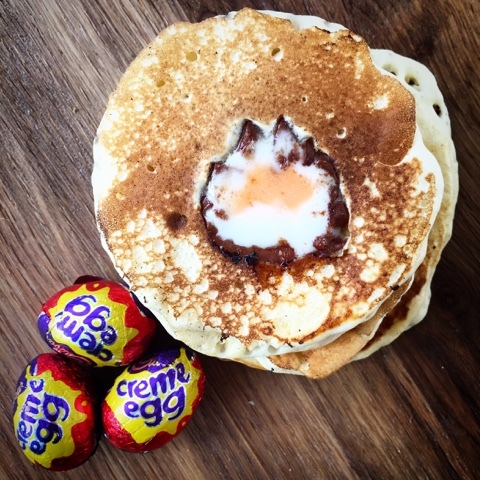 Use a small whisk or spoon to create a whirlpool in the pan and crack the egg into the middle. Leave to cook for 2-3 minutes then remove with a slotted spoon and drain on kitchen roll. 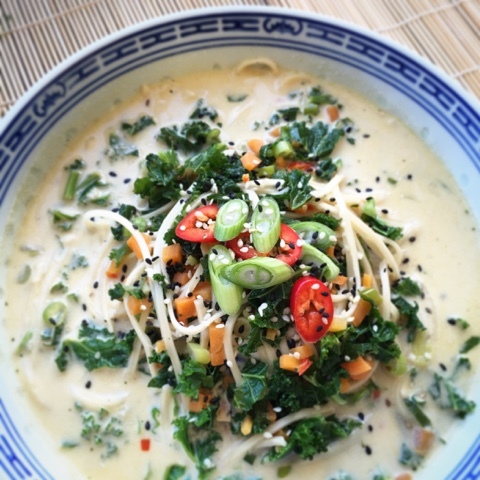 For further Noodle Bowl Inspiration here are some fab recipes from food blogging friends. I'm definitely putting coconut milk in my next one.